Mozambican decor and food served at its very best! 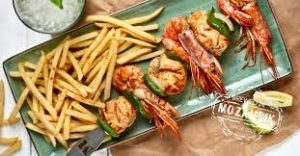 Mo-Zam-Bik Restaurant’s offer a place where family and friends can get together and experience the culinary delight of Afro-Porto cuisine without any passports required. The aim is to take your taste buds on a flavourful journey whilst offering a relaxed atmosphere and friendly service at all times, as you enjoy a mouth-watering meal and embrace the rich flavours that is provided in true Mo-Zam-Bik style. The extensive seafood menu offers a variety of fish and prawn dishes, all cooked to perfection in secret fish spice or a range of sauces. For those looking for something a little meatier, you have the option of succulent steaks done in a style of your choice, all creating a flavour explosion that will keep you coming back for more.